State Mandated Reserve: $1.1 million to rebuild the reserve for economic uncertainty to the state-required level. Specified Risks: $3.9 million to address known operating expenses identified by the Superintendent. Unspecified Risks: $4.0 million to address possible unknown expenses or overspending due to poor internal controls. The resolution also starts charting a direction for the 2018-19 school year by requiring zero-based budgeting for central office budgets, calling for increased engagement in budget development, and establishing preliminary timelines and criteria for the 2018-19 budget. This is an important action taken to balance the budget and retain local control. Without these adjustments, OUSD was certain to enter state receivership. However, OUSD is not out of rough waters. The coming months will show if this was the right level of adjustments, or if the internal financial improvements OUSD has and will implement are working or not. Everybody is mad, and understandably so. Students and educators have suffered directly because of these budget challenges. As OUSD’s post-mortem said, this is a complex problem caused by hundreds if not thousands of past decisions. As such, addressing those issues will take time. However, the OUSD Board of Education needs to be held accountable and to a high standard for the coming years to ensure that the underlying issues are addressed and the foundation for a better system is being laid. We will continue to provide updates to share the latest information, but also to advocate that OUSD align to best practices to not only avoid this in the future, but to create a district that thrives! (click here to sign up for the blog). Engage families and community. To truly right the ship at OUSD, school communities and departments need to be engaged about needed further changes in the development of the 2018-19 budget starting again in January. Hire a Chief Financial Officer who is ready to change how OUSD budgets and improve financial controls—see following recommendations for how. Adopt foundational policies and internal controls aligned to best practices—such as building the reserve to increase stability and establishing a long-term planning policy to ensure OUSD is plotting out its future strategically. Increase budget transparency and communication by aligning to best practices, communicating information clearly and accessibly. Realign and resize central office to best serve kids and align to OUSD theory of action to support school site-based decision-making. Implement a zero-based budgeting process with clear measures of how programs are impacting students. Zero-based budgeting means that instead of just rolling over a budget from year to year and assuming everything should stay the same, that you start from scratch and really ensure that the programs with the most impact on students are prioritized and others are phased out. (See, Government Finance Officers Association and Harvard Strategic Data Project). Start a productive conversation to promote quality, equity, and fiscal stability for all Oakland students in our public schools (district-run and charter). The financial stability of OUSD depends on the number of schools in our city and how need and resources are distributed within the district and among district and charter schools. With rising costs and flat funding, Oakland students cannot afford for adults to work in isolation. Our #1Oakland campaign will dive deep into this work. This has been an incredibly painful fall for the Oakland education community. 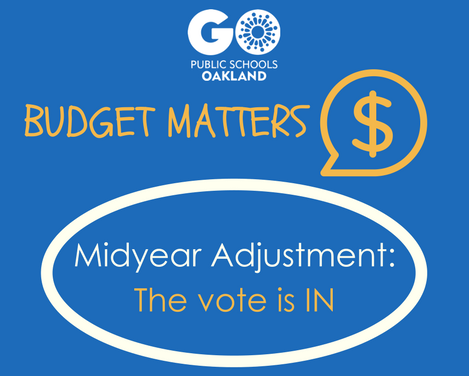 As we look ahead to the 2018-19 and then the 2019-20 budgets, there are incredibly important and necessary changes to be made—changes to the central office, changes to funding school sites, but also changes in how OUSD fundamentally approaches the budgeting process. We will work to bring more information about best practices from school districts around the country that can help provide guidance as Oakland addresses these issues. The coming months will be critical to righting the ship and providing the stable foundation Oakland’s students and educators deserve. Sign up for the Budget Matters blog for more information, updates, and upcoming events.